This image of Jupiter's icy moon Europa, the first Europa image returned by New Horizons, was taken with the spacecraft's Long Range Reconnaissance Imager (LORRI) camera at 07:19 Universal Time on February 27, from a range of 3.1 million kilometers (1.9 million miles). The longitude of the disk center is 307 degrees West and the image scale is 15 kilometers (9 miles) per pixel. This is one of a series of images designed to look for landforms near Europa's terminator - the line dividing day and night - where low Sun angles highlight subtle topographic features. 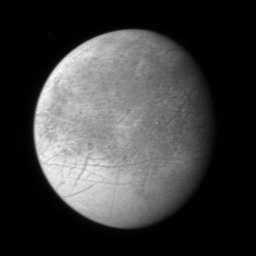 Europa's fractured icy surface is thought to overlie an ocean about 100 kilometers (60 miles) below the surface, and the New Horizons team will be analyzing these images for clues about the nature of the icy crust and the forces that have deformed it. Europa is about the size of Earth's moon, with a diameter of 3,130 kilometers (1.945 miles). This is one of a handful of images of the Jupiter system already returned by New Horizons during its close approach to Jupiter. Most of the data being gathered by the spacecraft are stored onboard and will be downlinked to Earth during March and April 2007.